Racing Beat - offers adjustable front bar w/ hollow tube and adj. end links. The front bar tube is available in different sizes. The rear bar is not adj. Nylatron bushings on the front bar. Very nice setup. See Jim LaBreck's review below. Pettit - These have received good reviews from local autoxers. Tri-Point - They offer two kinds of bars: the blade-type bars as used on their ASP car, and a tube-type. The blade bars are adjusted by turning the blade from horizontal (softest) to vertical (stiffest). This is supposedly the best bar out there, but it is priced accordingly (around $1,500 for the front). Their tube bars are a little more reasonable at $470, but still not what I would call economical. This bar consists of the adjustable end links plus a torsion tube. The tube can be sized from .125" to .250" wall thickness. Tri-Point sells solid rear bars that should be matched to the fronts. These are $120 or so. The rears have two holes for adjustment of arm length, but are not what people would typically think of as adjustable. Mostly Mazda - Sandy Linthicum (linthias@sandy-ntws.usps.gov) said "Mostly Mazda has super ones for the front, ajustable with heim jointed downlinks replacing the stock ones. They also have sway bar supports." Addco - seem to be low cost, but several people have said they like them. Both M2 (3 adj holes, alum arms) and TP (5 holes, alum arms) are 1-1/4 inch dia, and have 3 or 4 tube thickness options (Brian thinks his M2 is 1-1/4 inch). For the popular .188 inch wall option, the big RB tube is 18% stiffer than these two. TP has thinner wall versions. The .125" is 77% as stiff a tube as the .188", and the .095" is 63% as stiff. A thick .25" is also available, 14% stiffer than the .188" tube. I think M2 has similar, if not identical options. The M2, at $385 complete, appears to be a good buy. 1.25	.188	 62 		M2, TP, EB, PF? Rear stock bar is hollow, and larger (17.3mm) in 93 only, all models. Only 19mm upgrade is available (forget the .88" solid Addco bar). Vs the big stock 93, the solid 19mm will be about 50-60% stiffer at stock arm length. I tested the EIB hollow rear at 30% stiffer at 'long' hole, and 50% stiffer at 'short' hole. RB sells a separate 19mm hollow rear bar, looks to be non adjustable. RB, TP, and M2 have a 3-piece splined design. Stiffness listed assumes 'stock' arm length, although this may be between adj-holes. TP has optional solid pivots that effectively shorten the arms, making it stiffer. Eibach is changing design, solid?, so current size may change. I have this set. Rear fit needed a lot of work. Front is VERY stiff, nice at track but degrades street ride a bit. With bigger front bar, support bracket bracing is needed. Check RB, TP, CWC (raises bar for more ground clearance), and M2. I like M2's 1-piece support assembly for $250, stout mounts with RB'ish bracing. If you value comfort, just add an Addco front bar. Solid version of stock 28.6mm hollow bar, 40% stiffer, and only upgrade that uses rubber pivot bushings (oem) for best ride comfort. Should work well with stock 93 rear bar, mabe push a little with 94+ rear bar. The Addco rear bar is 22mm, solid, and useless to all. I just wanted to state for the record that the values I provided for the Racing Beat bars is indeed correct. These values were obtained by actually measuring the dimensions of the bars (both front and rear, stock and RB) and calculating their stiffnesses. Kevin's dimensional data for these bars (which was gathered over the phone, I assume) is incorrect. For instance, the front bar is actually 1.375" in diameter with a .188" wall thickness. I mean no disrespect to Kevin, I just wanted to set the record straight. 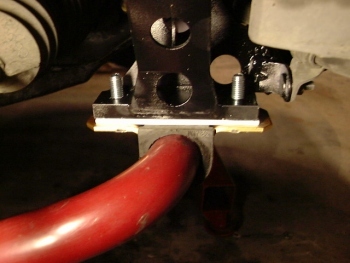 The front swaybar of the FD can improved inexpensively, with the addition of firmer bushings and better end-links. 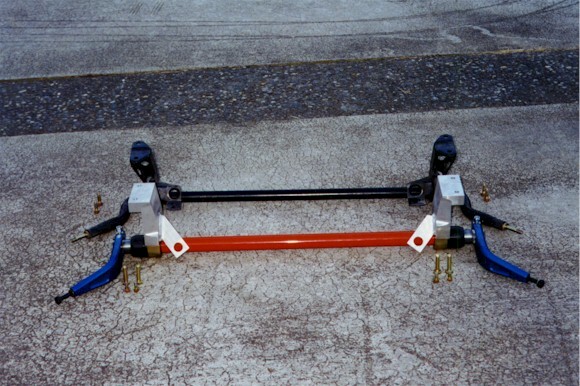 The rear swaybar, however offers fewer options. There are no separate end-links to replace, and the stock u-brackets and bushings are a just-barely fit in the space - no room for wider bushings. 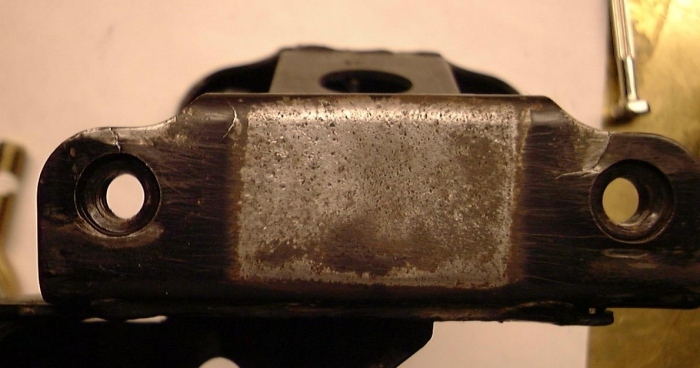 One can, however, firm up the stock bushings considerably, to balance improvements in the front. What this mod does is remove most of the deadzone across the center of the rear swaybar. It might take as much as an inch of slop out at the bar-end. This adds just a bit of oversteer, to help compensate for the understeer from front bar upgrades. Most importantly, it makes the action of the rear bar more linear across the transition and more predictable. The difference is noticable (for about a day) in the direction of more predictable handling. I haven't noticed any added noise. Start by procuring a two or three (see below) stock rear swaybar bushings for your car (may vary by year) The rubber bushings are available as a separate partno at under US$20 for two. When you get them, measure, because I am quoting measurements from months-old memory, and my memory leaks. 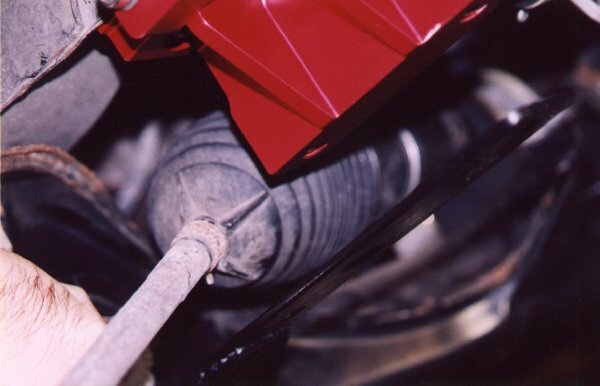 Examine the rubber bushing - note that there is 1/2" of very compressible rubber between the bar and the flat (car-body) side of the bushing. The goal is to replace most of that rubber with something less compressible. The local plastics shop sold me a 1" strip (Measure!) of 3/8" black plastic a few inches long. Cost less than a buck. I then cut a couple of 1"x1" pieces, and filed a broad squared notch in two sides to match the flat side profile of the rubber bushing. Cut or grind out 7/8"-wide and 1/16" deep on two opposite sides, to allow for the u-bracket that the bushing fits into - it is sort of a really wide Capital-I shape when you are done - a rectangle with four 1/16" serifs. Take a very sharp knife with a long blade (carving knife), and lubricate it with liquid dish detergent, then use it to cut exactly 3/8" from the flat side of the rubber bushings. This works best if you lay the bushing on its end, with the flat side against a 90-degree surface to help hold the bushing straight. 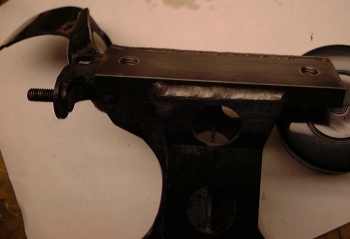 (If you are not confident that you can do this in one long clean slice, buy a spare bushing to practice on.) This should leave 1/8" of rubber between flat side and bar, just as it is around the u-bracket. Lubricate the rubber, and install the modified bushings with the plastic piece between the rubber bushing and the car body. This involves two bolts at each u-bracket, and should take about 5 minutes. The bolts may require some penetrating lube. My new Penskes and anti-sway bars should be here shortly from Tri-Point. Just thought I would update people on their anti-sway bars. The new front bar is pictured here with the old one. I was going to order the .250" wall tubular bar for the front of my car, but Craig said the tubular rear bar to match that was so hard to make that he wasn't going to do any more (unless I want to pay $1000 - 1500 for a one-off). They will still sell the .250" front bar, but no one makes a rear bar (even the solid ones) that will match this. He said that the only application for the .250" front one would be for road race cars where you might want some push to it (with the bigger front bar and a smaller rear). If anyone else is interested in getting the bigger tubular bars (front and rear) instead of the smaller tubular front one and solid rear, email me privately. If we come up with enough people, we may be able to get them to run off a batch of the rear tubular bars. Not sure what the exact price each would be for a batch of these, but they originally quoted me about $500 when they thought they were going to make more of these. I bought the RB anti-sway bar brace from RB for $78 a while ago. Tri-Point will also sell this. On a different subject, Tri-Point should have their catalog out very soon. I have Complete Custom Wheel (CCW) 17x10" wheels on the front. I had a small problem with my CCWs rubbing when the steering was at full lock (only when parking). It turns out that this was caused by the wheel rim rubbing on Tri-Point's tubular bars: They hit the ends of the aluminum lever bars (barely). I don't see this as an issue, but just wanted to let people know if they are contemplating this combination. However, it could be an issue if this knocks the weights off of the wheels if you have the clip on kind of weights and they are mounted inboard. This may be peculiar to the CCWs, since they also are known to have clearance problems with big brake kits, that are not experienced with other wheel mfrs. But then on the other hand, it is the rim lip that hits the end of the bar, and this should be in the same place on all 17x10 wheels. > is also sold by Pettit and Mazdatrix. I must once again caution against using the Racing Beat bar on the track. I suffered a broken arm while accelerating through a left hand corner at 90 mph! I have also seen one other bar broken at the splines in this same location. Both bars were torqued to RB specs. DO NOT USE THE RACING BEAT BAR on track. Spend the extra $150 and get the Tri-Point bar. It works better, too. Just for general information, I removed my Racing Beat front swaybar, (which will soon it will be on its way to someone else) and replaced it with my R1/R2 front bar, and thought someone might benefit from a head-to-head comparison of the two. The Racing Beat front bar, for those who have seen pictures or a live specimen, is a huge (and I mean HUGE) red bar with annodized blue forks attached using a spline system. The R1/R2 front bar is a fairly beefy piece of black metal, with crimped ends. After replacing the old bar yesterday, the difference was immediately noticeable. Whereas the car used to corner like "a rock on the end of a piece of string", the car still corners well, but there is noticeable roll (not much, but compared to the RB bar, it's very noticeable) in the front end. I retained my RB rear bar, and it makes a world of difference when compared to the PEP/Touring/R1/R2 rear bars, so the difference between the front and rear of the car during "spirited" cornering was also obvious. Eventually I became "used" to the setup, as I drove home last night, and by the time I got home, it was second nature and the car felt "right" again, but the brief comparison immediately following the swap was interesting, and I'm sure that a side-by-side comparison of an FD equipped with the RB bars would show that the system is superior to the components that came from the factory. I would highly recommend both front and rear bars, but especially the front for those of you involved with road course and track events. The rear bar should be an immediate upgrade for those with PEP and Touring suspensions, as the rear gets alarming light in high horsepower/high speed cornering situations, and the swaybar made a world of difference. The front RB bar, by the way, goes for $377 new from Mazdatrix. The rear bar is considerably less expensive (about $120 or so?). Prior to their installation, the car would want to "walk" (for lack of a better term) in corners at high speed. The rear would become semi-loose and it wasn't a confidence builder, especially when we were screwing around on twisting backwoods roads (freshly paved for our enjoyment, though) and it happened at 85-90 mph in one left hand sweeper. The rear suspension would come unloaded at some point, I'd get a little hop or shimmy out of the rear of the car, and we'd be through the corner. Not sure how close to losing it I was, but it didn't feel good, which goes without saying. After I put the bars on, and adjusted the rear bar to its lower setting, this immediately went away. The stock rear bar is puny and there was an immediate improvement in the feel (and my confidence level) of the car in high speed cornering. I then found that on tight turns at moderate levels of speed (35-40) that the rear suspension would load up and twist "coming out of the hole", which was equally annoying, so I backed the bar off to its loosest (hole closest to the bar itself, not towards the end of the bar tips) setting and I've been happy as hell with it ever since. I removed the front bar and replaced the OEM front bar after awhile and did some back-to-back comparison, and while there was a very small but still noticeably increase in stiffness in the front end, the R1 bar felt much more natural and performed almost every bit as well as the Racing Beat front bar. I figured that $377 probably wasn't even close to being worth the small improvement. Bear in mind that I had the FTL billet sway bar mounts on the car, and they alone provide a huge improvement in stiffness over the stock mounts. So would I recommend replacing the front bar? Probably not. The rear bar? Definitely. For $120 and the price of an upgraded sway bar mounting kit (with the FTL kit out of production, I'd recommend the Crooked Willow ? kit) you can have a vast improvement in handling. I doubt the price of an upgraded front bar would justify itself, though. By the way, all OEM front bars are identical, regardless of year or model. Your final set-up was stock front bar, and a bigger RB rear bar set at it's stiffest setting, as I understand your post. . If I ran this set-up, with no other changes in my car, I'd have huge oversteer, and slower times at the track. The behavior of a given sway bar pair will vary with the car's spring rate balance, and to a lesser degree the differential oil, shocks, driving style, suspension alignment, etc. It would help to know your set-up to put your experience in perspective. I found I had too much rear lock-up at the torsen, such that back end came out way too easy when road was wet. When I emptied the factory rear oil, and put in redline, I also added a little bottle of xtra friction modifier....slippery stuff. Much better for me wet, or at the track. A grabby torsen can influence bar sizing. I just got the tubular front and rear anti-roll bars from Racing Beat, based solely on subjective comments from others, so I thought I would put some real data out for those who may be considering this purchase. I calculated the percent increase in stiffness over the stock front and rear bars. I did this for both my 94 touring, as well as my friend's 93 base. The rear bar on his 93 is 33% stiffer than mine, which explains why my car has significant understeer and his is neutral. The Racing Beat rear bars has two holes for the links, allowing a little bit of adjustability. Anyway, here's the breakdown. So, the RB bars will increase roll stiffness substantially (not as much as the above numbers since they are only comparing bar stiffnesses), while giving the car a slight understeer tendancy, which should be good for road course work. I'll be able to give some subjective opinions after I get a set of "bomb proof" sway bar mounts. I am considering of removing the entire Racing Beat anti-roll bar setup and go with the Mazdaspeed anti-roll bar set. Can anyone take a guess at what the cornering characteristics of this either setup would be like? 1. I have the Mazdaspeed coilovers, which I believe are designed in conjunction with their anti-roll bars, I would rather work with one company's entire tuning programme. 2. The urethane bushings on the rear are extremely noisy ( I lube them atleast twice a year with white lithium silicone) and the bushings never fit right, I had to carve them out for the bracket to hold them. Over lubing made them shift and I was only able to fit one of the 2 clamps they sent me to stop it from shifting. The second just can't fit, no room. Yes, to a certain extent. As long as the bars exhibit the same characteristics it should make no difference from whom they come. And there is a whole test/tune issue too if you get adjustable bars - you need to adjust them to get a setup you like. (Don't know if the Mazdaspeeds are adjustable.) The point is - if you have the Mazdaspeed coil-overs and are looking at two different stiffness Mazdaspeed bars, then you will have significant difference in the bars behavior with the same coil-overs. You can get other companies' bars that are within the range given by the two different Mazdaspeed bars you listed. >to stop it from shifting. The second just can't fit, no room. The rubber ones will need replaced more often than the uethane ones, so you may not be buying yourself much time savings. Especially since you should check the suspension anyway before events - would not take tons more time to lube everything up. I have drilled my bushing brackets and added grease zerks to make lubing these simple. Just drill through the bracket to accept a zerk and then continue on through the bushing with a smaller drill bit size. This is posted on the suspension install page on my site. As far as the shifting problem goes, you can buy clamps to prevent the bar from shifting. These are basically glorified hose clamps around a urethane bushing. These go outboard of the mounting brackets, or could probably even go inboard. The bar shifting is what destroys the rear end links (mine had to be replaced already at about 7K miles). So the clamps should probably be added no matter what bars you end up with. 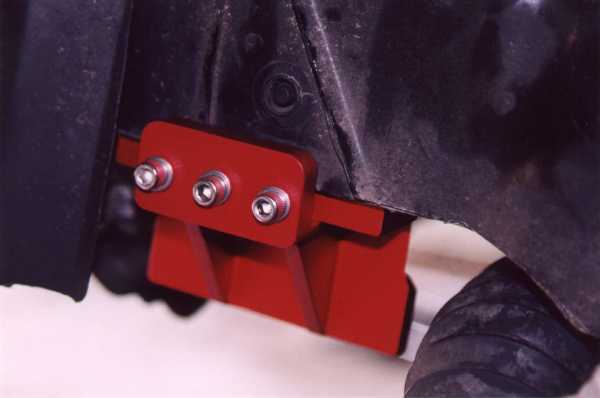 In fact, if the bar does not shift with rubber bushings, then the rubber bushings are probably clamped too tight and are preventing the bar from rotating in them properly. My Tri-Point rear bar (an RB bar selected by TP to match their front adjustable one) came with these positioning clamps. I am very happy with the Tri-Point adjustable bar in front and their matching rear bar. 1. SIDE TO SIDE: The Racing Beat reinforcement bar provides lateral (side-to-side or X-axis) reinforcement. It is a good bet, and is what I bought for my car - $78. Mazdatrix also sells the RB unit. 2. FRONT TO BACK: Tri-Point makes reinforcement braces that provide longitudinal (fore-aft or Y-axis) reinforcement. These can be used in conjunction with the Racing Beat reinforcement. Both will really solidify the front. 3. 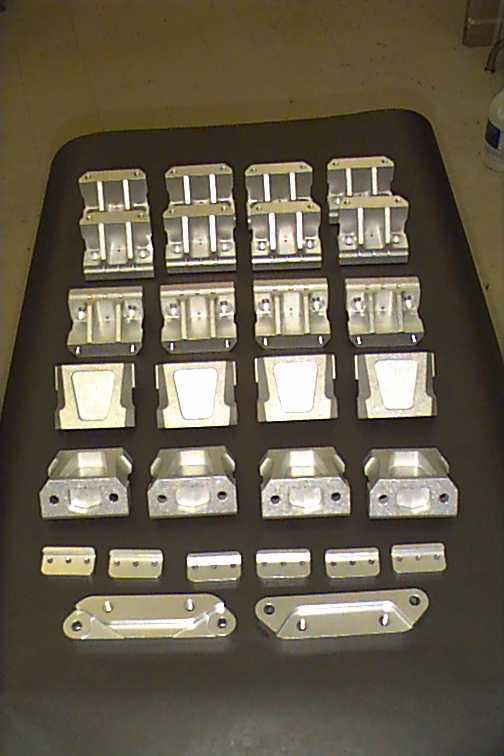 TOP TO BOTTOM: The third type of brace is simply a replacement for the stock mounting bracket, and provides vertical (up-down or Z-axis) reinforcement. The Widefoot mounts (from David Breslau) provide a replacement for the stock mount. These also offer side to side and probably front to back reinforcement as well. Trev Dagley (under the FTL name) used to make mounts similar to the Widefoot. Jim and Trev discuss Trev's billet aluminum mounts below. It sounds like they can be used with the two braces I already have (shown above - the white bar running parallel to the anti-sway bar is the Racing Beat brace, while the Tri-Point brace runs at a right angle to the bar and is mounted under the gold-colored bearing). Note: Trev's mounts are no longer available. Trev was selling these under his company name: FTL (Faster Than Light). Also, M2 (Mostly Mazda) has a 1-piece support assembly that needs no other braces. and sells for $250. It is 2 sturdy brackets, linked by a transverse tube, and anchored at 2 central tabs like the RB brace. If you use the TP fr (adjustable) bar (also sold by Mazda-Comp), with the OPTIONAL TP rigid bronze bearings, then you MUST buy the TP for/aft braces. This is because these bearings have long housings, wide bolt separation, and will move the bar back about 3/4 inch. The braces include extra holes to mount these optional bearings. I'd guess the bar would rattle a lot on the street in bronze brgs, vs the normally supplied polyurethane. It is possible to get large for/aft angles on the vertical links for this adjustable bar, and develop very high for/aft forces on the brackets. This TP bar can be very tough on bracket supports, and the frame below. The TP braces should be considered here with any support option, if max adjustment angles at the links are needed. The M2 brace works in both the lateral direction as well as the vertical one. I purposely stayed away from other vendors products when I designed my mount. I did look at John Levy's FTL mount *after* my version was finalized, and I do appreciate the clever work that you put into yours. swaybar function or other interference with the raised bar. the Racing Beat traverse brace works very well with it. mount is on the other side of the sheet metal. to make sure it's not stressed at the attachment points. I try to do quality work. I hope nobody minds the commercial content, but I wanted to make sure that their was no confusion between the mounts than I'm making, and the jerk who stole Trev's design. Shorter by ~1.3", to prevent bottoming out on lowered cars, or when going over bumps. No interference with body or suspension arms. Built in stabilizer - no need for additional braces (although the Racing Beat brace compliments the mount). 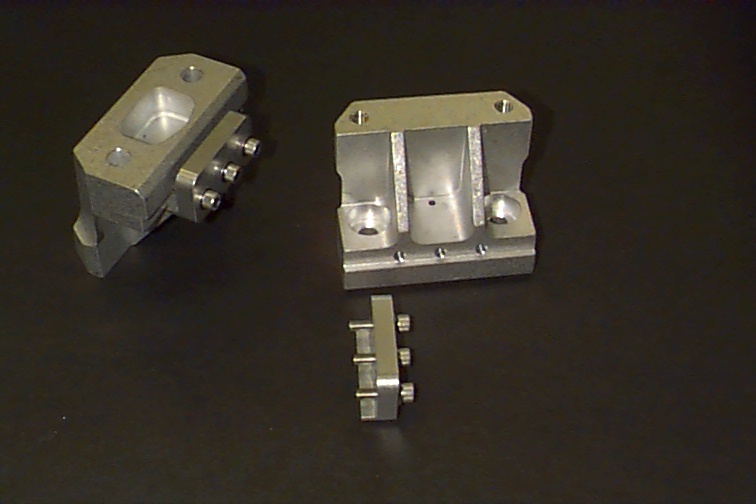 Special clamp helps prevent fatigue failure at the frame attachment point (not found with any other after-market design). Fully machined billet aluminum, stainless steel 8mm Helicoil threaded inserts. Anodized red just to make sure they stand out (other colors available at extra cost). Excellent value - $325 includes sway bar brackets, clamping blocks, radiator support brackets, and high-grade hardware kit. Why change your stock mounts? 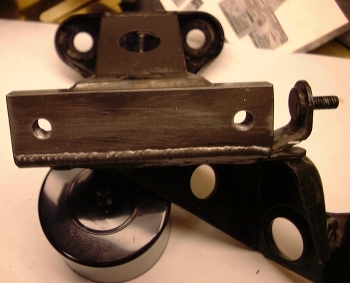 A number of on-track failures of the OEM mounts. The sudden oversteer condition that this causes can and has lead to "off track excursions". The OEM design is not properly triangulated, so that there's a "parallelogram" geometry that leads to excessive flexing at the bent corners under load. Over time the cyclic stresses can lead to sudden failure. The load path (how the force of the bar being twisted is transmitted to the frame) is offset, that is, the attachment point for the bar is not in the same plane as the attachment of the mount to the frame. This continual bending force on the mount and frame every time the sway bar is put under load creates the stress that leads to frame/mount failure. The frame to mount attachment point is weak, as only two bolts retain the mount, allowing a sideward motion under load that eventually can fatigue the frame rail. The stock mount tips the sway bar down in front, making the bar the lowest part of the sprung body. Impacts due to lowering the car, or hitting curbs, puts tremendous loads into the OEM mount and frame. Our Widefoot SBM's are designed to combat all these problems. Machined from solid 6061-T6 aluminum bar, they are heavily ribbed for stiffness. 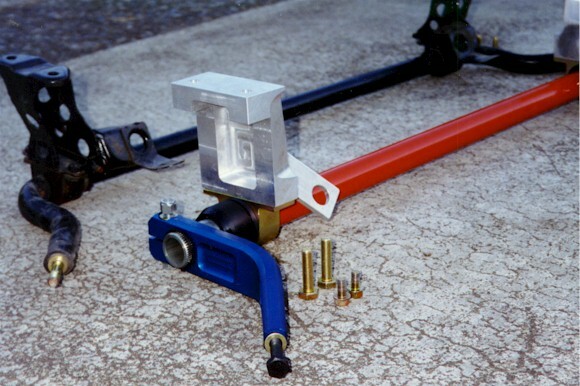 The lateral flexing caused by the sway bar load is prevented by a (literally) unique clamp that both stabilizes the mount, and reinforces the frame rail. 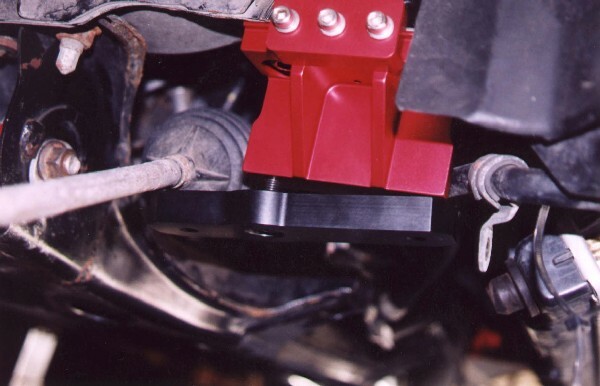 The Widefoot SBM is shorter than the OEM mount, raising the sway bar away from the road. This helps prevent impacts against the road or track berms. A stiffer mount allows the sway bar to be more effective, making the handling of the car a little "tighter" or immediately responsive. We have a packet of pictures available to those wishing to see the quality and brawn of the Widefoot SBM. Please direct your requests to dkrumweide@coi-world.com. Pictures will also be available on the Crooked Willow web site within the next week. Our initial production run is nearly complete and we are ready to take orders immediately. All orders will be shipped on a first come, first served basis beginning on September 10, 1999. >anyone shed any new light on this? 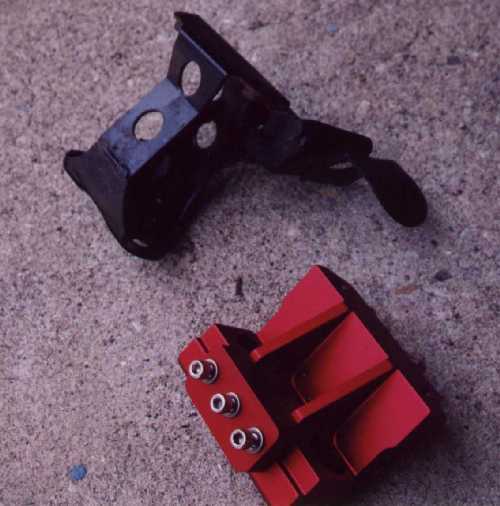 The prototype Widefoot Swaybar Mounts (WSM) were originally tested on a car with the Racing Beat transverse brace and stock mounts. We found that flipping the RB brace, and using 1" long spacers and longer bolts at the steering rack attachment point worked very well with the WSM. It's a bit of "belt and suspenders", as the built-in WSM brace also stiffens the mount in this direction, but more is always better... ;-) FWIW, my analysis of the stock mount is that it's weak in the lateral (left-to-right) direction, but acceptable forward-and-back. I have not set up a car with the Tri-Point brace yet, and I really don't think it's needed unless you're using their bronze bushing kit. This kit requires their brace, because the brace incorporates a new rearward bolting point for the bearing saddle, moving the swaybar ~3/4" to the rear. The problem is that the T-P brace has little vertical compliance, and the WSM is over 1.25" shorter than the stock swaybar mount (for improved ground clearance). I believe this is too much for the brace to accept, so some design work would be needed. If you are using bronze bushings, let me know, and I can come up with a new saddle clamp that works without the brace, and keeps the swaybar in the stock location. I've designed a simple adapter, about .60" thick, that allows use of the T-P "short arm" bars with my mounts. Victor Masch (vmasch@mindspring.com) has them if you want to get an opinion of them. >the bar back to stock height. Flip the RB bar over, and use spacers and longer bolts (10 x 1.25mm) to grab the steering rack mounts. I did this with the prototype mounts, and it works fine. The adapter spacers will lower the swaybar anyway, perhaps a little careful bending of the RB mounting tabs will allow it's normal use. I now have the black anodized Tri-Point adapters in stock. This is a plate that bolts to the WSM, and has the appropriate mounting point for the T-P pillow block bearing, and new hardware as needed. Note that the adaptor can not be tightened due to the drooping of the wheels when jacked up. David offered to modify the TP bushing bracket (I think this is referred to as a saddle clamp? ), but I was not comfortable with this approach. I would highly recommend these to people who are not using the TP bar, as David's mounts are works of art, and David was great to work with. Note: the remainder of this section is old information on Trev's mounts, which are no longer available. I would also recommend upgrading your front swaybar mounts to Trev's aluminum mono-block creations, which are extremely rigid and appear, at least so far, to cure the problem with the factory mounts rocking and fatiguing or tearing the subframe. The mounts he has currently come with front tabs which relocate the radiator 1 5/8" down and to the rear, opening the intake area. It's an easy swap, good insurance on not having to replace or weld your subframe, and well worth what he's asking for compensation. Also, you may want to either have made, or purchase as set of billet aluminum sway bar mounts from me, as the stock ones tend to flex, and or break. The Racing beat brace is not the best solution, although should be used as well, esp with the upgraded front bar, and if you are really serious, you can add the MazdaComp longitudinal braces. Cost is $220 plus shipping, and includes the machined aluminum upper radiator mounts (this will also move the radiator back 1-5/8" in plane which would allow for future IC, and air intake solutions), and all the mounting fasteners. This is a good deal considering MazdaComp sells stronger stock mounts for more than that, which still flex. The version which moves the radiator back 1-5/8" are $220 a set, and include fasteners, upper radiator mounts, and threaded inserts. You probably only want these if you are building your own ram air intake, or large IC ducting. The version which keeps the radiator in the stock location are $240 a set, and include fasteners and threaded inserts. The answer to the other main question I keep getting: Yes, any sway bar which will will bolt up to the stock mounts will work fine with these. 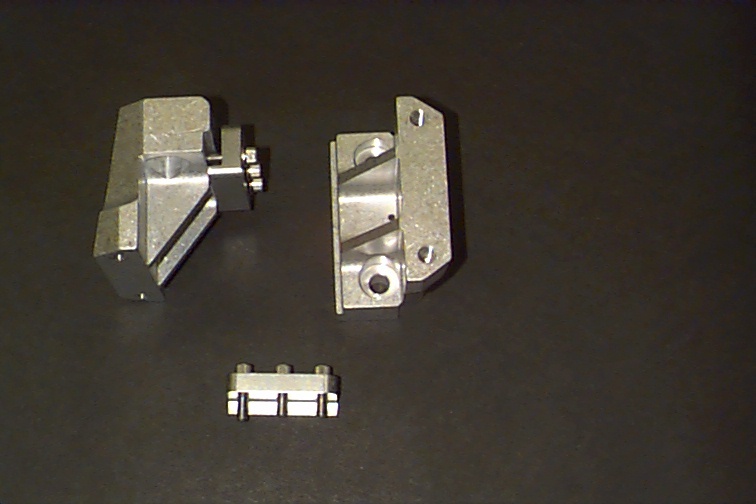 Also anything (such as the Racing Beat or Tripoint brace) designed to work with the stock mounts should work fine as well in case you are already running one, there is no drawback to using those as well. I received the attached clarification from Howard Duncan - SCCA Solo II Rules Interpretation - concerning the use of after market front sway bar bracket mounts, David Greslau's Widefoot in particular. They are legal. Thanks to all of you who answered my original question. Section 13.7 allows for the replacement of the front sway bar, including the end links and brackets. The only restrictions are that the brackets cannot connect the two front frame rails with a lateral bracket or component AND the frame cannot be modified, other than drilling holes for mounting bolts. Otherwise the mounting brackets are unrestricted. If you need further clarification, feel free to contact me.